Food insecurity in sub-Saharan Africa (SSA) results from low crop productivity linked to low fertilizer use and multiple soil nutrient deficiencies. Despite wide variability in soil fertility, current fertilizer recommendations for maize are mostly of a blanket nature. Fields that are low in soil fertility often give poor returns to the predominant N and P fertilizers used, as there are other nutrients beyond N and P limiting production. To achieve sustainable crop production intensification in SSA, the fundamental issues of providing the crops with adequate nutrients under the highly variable soil fertility conditions must be properly addressed. 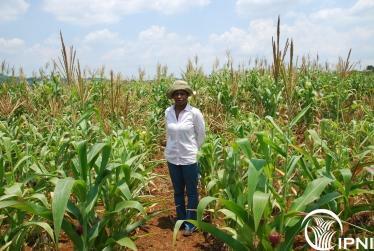 The Coordinated Maize Research Program developing nutrient management strategies to optimize crop productivity in SSA. The focus is on appropriately defining the potential, attainable yields and nutrient limited yields under variable soil fertility conditions. This will provide platform to develop target yields that suit food security and economic objectives of various categories of farmers. The program is implementing nutrient omission trials at key benchmark sites in Kenya, Mozambique and Zimbabwe, Tanzania, Uganda and Malawi, to establish the capacity of soils to supply N, P and K and micronutrients, and derive fertilizer needs to reach a target yield. The nutrient omission trials, located at multiple sites, are designed as a diagnostic tool to identify which of the macro-nutrients N, P and K are limiting maize growth, and to determine the possible other constraints related to soil secondary and micro-nutrients and soil acidity. The project are be used to calibrate the Nutrient Expert for Hybrid Maize, a decision support system for helping researchers and extension agents to develop site-specific nutrient management recommendations. Spatial analysis will also be conducted to develop a village-scale soil fertility map and spatially explicit nutrient management recommendations. The project’s pilot sites are in the ‘bread basket’ sub-humid zone (800-1200 mm annual rainfall) with high potential for maize production intensification in East and southern Africa.